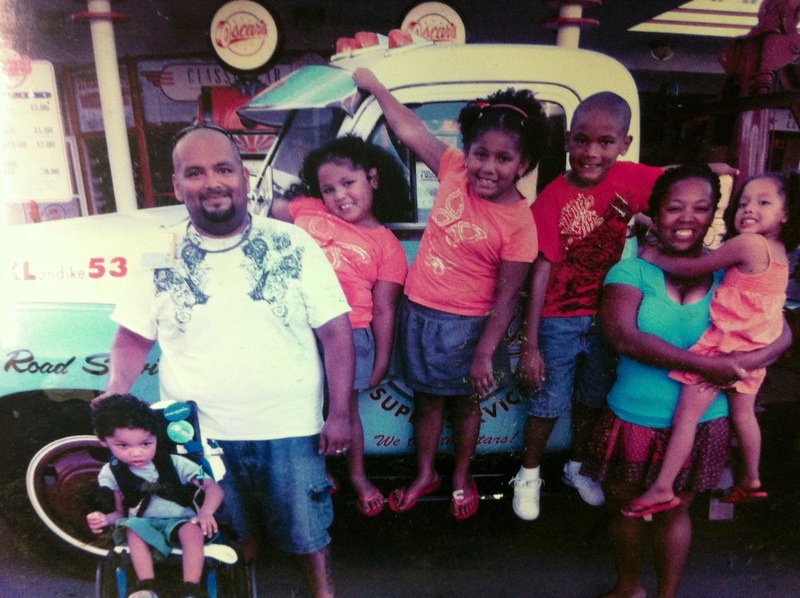 Manuel Echevarria (left, front) was taken by child services from his family in August 2012 after a series of events that began when he was taken off Medicaid's disability coverage by a caseworker, in error, and the family lost home nursing care. Manuel, who has cerebral palsy and complex medical needs, including a g-tube and seizures, was returned to his family three months later. His parents were acquitted of neglect, but never received an apology. The family lives in Indianapolis and are pictured on a Disney holiday. I spoke with Manuel's mother Angelic. Manuel's nickname is Bear Bear. BLOOM: Tell us what happened. Angelic Echevarria: My husband and I were both working and Bear had 12 hours a day of nursing care. I worked during the day and my husband worked nights. Our caseworker took Manuel off traditional disability Medicaid and put him on Medicaid for a typical child. This meant we lost our nursing care and my husband's pay cheques were abruptly garnished by our hospital. We eventually lost our house and I had to resign from my job because Bear's medical needs were so great. BLOOM: And shortly after this Manuel was hospitalized? Angelic Echevarria: Yes, Manuel was hospitalized with a serious stomach virus for one-and-a-half weeks. The whole family was staying across the street at the Ronald McDonald house. We had lost our town house but were to move into special-needs housing in a week. The doctors and social worker had a conference to discuss Manuel's care and other issues. BLOOM: What did they suggest? Angelic Echevarria: They felt we needed a break because Bear's Medicaid coverage hadn't been figured out and we had no home nursing. They suggested Manuel go into a respite facility for two weeks. He went there for the weekend but when we visited we found him by himself in a ball pit. The nurses were talking and eating in a back corner and not interacting with the young people. My son can barely turn over on his own or keep his head up. I was concerned about his safety and asked to take him home. We couldn't get in touch with the hospital social worker because it was the weekend. The respite nurse said we could take him and that they had never seen a little boy so well taken care of. We took Bear back with us to Ronald McDonald House. We planned to drive to my parents' house in Chicago and stay there until we could get into our new home. Instead of the social worker giving us a chance to explain about the ball pit and Manuel's safety, she called on Monday morning and said child services had been called. I thought they would speak to us and listen to why we took Bear out of the respite place. But never, ever did I think they would take him away. Angelic Echevarria: They came to Ronald McDonald house with the police and an ambulance and told us to sign a document and we got to kiss him and try to explain why he was being taken away. They took him back to the hospital. They told us it would take time for the court date but we could visit him. We had timed visits with him in a hidden part of the hospital where we were watched through glass. It was heartbreaking to be treated like a criminal. After a couple of days Manuel was taken to a new respite facility two hours away. BLOOM: Why were you charged with neglect? Angelic Echevarria: I had failed to listen to the doctors' orders and taken him out of respite early, and we were considered homeless, even though we were able to live with my family until our special-needs housing was ready. I was told I was a selfish mother who used the hospital for her own gain, because I had asked the social worker for parking passes and help with medical supplies. My husband and I were made to look like monsters. Angelic Echevarria: We were out of our minds with grief. We took our older kids to their grandparents' house to live because we wanted them to be safe and happy. Lawyers told us it was important that my husband keep his job, so he and I lived in our truck so he could continue to work. I prayed very often just to keep my sanity. BLOOM: How were you able to see Manuel if the respite facility was two hours away? Angelic Echevarria: The facility was close to a river and they rented out log cabins, or we could pitch our tent and camp. We got there with our other children on Fridays and wouldn't leave until Monday, early morning. The camping helped us to cope because we made campfires with our kids, roasted s'mores or looked at the stars. It helped us so much to bear the pain of Manuel being right down the road and not being able to be with us. Once the staff got to know that we loved Bear they became very nice to us. They even helped to raise money so we could stay an extra night at our cabin and pitched in for toys for Bear's birthday. BLOOM: How did you get Manuel back? Angelic Echevarria: To get Bear back was like the fight of our lives. We had to ask for letters from his doctor in Chicago, where we used to live, and former nurses. Bear did have home nursing for a short time in Indianapolis so the supervisor who had come to my home on numerous occasions wrote a letter stating that there was no neglect of Manuel or my four older kids. Most marriages are already fragile with a special-needs child but when you have court every week and people accusing you falsely that's the most horrific thing you could do to a family. BLOOM: What impact did being in respite have on Bear? Angelic Echevarria: Bear would cry or get very angry. This facility tried their best, there were some great women, but of course it wasn't home and he wasn't with his family so it was very hard on him. BLOOM: How did this impact your other children? Angelic Echevarria: My children, Jose, 12, Angelina, 11, Mariah, 9, and Amarie, 7, were very affected. They would cry for hours. We would take them to Easter Seals for SibShops to help them speak about their feelings and we're still looking into more therapy to help them. BLOOM: How did you cope? Angelic Echevarria: I coped by praying. Somehow I felt like Job in the Bible. I didn't understand why and how this could be happening because I feel like I'm the best Mommy ever. My husband and I would lean on each other we would cry or scream, whatever we had to do to let it out. Being able to rent a cabin to be closer to Bear on the weekends helped. My sister and best friend and godmother helped with prayers and support. BLOOM: When Bear was allowed to come back, were you given an apology? Angelic Echevarria: My husband and I were acquitted of neglect charges, yet we were not given an apology. We had to see the social worker at the hospital who called child services. All she said was 'You all have been through a lot' and that she was changing departments. BLOOM: Is Manuel now on the correct Medicaid plan? Angelic Echevarria: Yes. Now his medical bills are paid and he receives nursing services, but just for school. I am fighting to get my job back. We've changed hospitals. BLOOM: How is Manuel doing now? Angelic Echevarria: He's doing the best he can, but his seizures have been horrible lately. We take it one moment at a time. My little fella is a happy Bear Bear. He loves his playdough and he loves his teacher and classmates in kindergarten. He loves his sisters and brother so much. They give him tons of kisses and hugs. We learn to love each and every moment we have. BLOOM: Why are you sharing your story? Angelic Echevarria: I hope it inspires people and opens up discussion as to why this keeps happening to good parents. Our caseworker told us of three other families whose children were taken unnecessarily by this children's hospital. I believe a lot of good parents whose children have special needs are being targeted for no real reason. Our prosecutor said 'If you're not a certain colour, don't have a professional degree or aren't husband and wife then they don't want you to come to their hospital.' We'd like to find other families this has happened to and unite in a class-action lawsuit. What a tragic and horrible story. This child was kidnapped by the state; my heart breaks for the suffering this family has endured. I wish them the best of luck in the future, and hope they can find others to unite in a class-action suit. This is a terrible story and a great injustice. It makes my blood boil. I am going to reflect on this and share it with other families on various bulletin boards. I think this experience is unfortunately, not uncommon. The actions of the state and the hospital involved are unconscionable. Thank you for sharing this very disturbing story, Louise. We need to speak up on issues like this, because this doesn't only happen in the US. If there's any way that the community at large can help this beautiful family and bring more attention to their story, I hope you'll let us know. I'd love to support their cause. What happened to them is an outrage. Thank you for this interview. This is a horrible story. I am outrage such events can occur. I too have a child with CP. The parents should definitely seek an attorney and sue the hospital and the state. All that pain and suffering to everyone involved, especially Manuel. Its absolutely heartbreaking. I am so glad he is finally home. Its just so sad that parents of special needs children have such an uphill battle sometimes. We had issues with my sons school this past year. His school refused to put him in a classroom. I ended up hiring a lawyer from CSNLG . It was the best decision we had ever made. He is now is a classroom. As he gets older I will continue to advocate for my son in any and every way I possibly can. We definitely need to speak up on issues like this, to ensure everyone is supported and given the rights their entitled. Thank you, Louise, for this interview, and thank you Angelic for sharing your family's horrific experience with all of us. I, too, would love to help out in any way that I can to spread this story. What's frightening to me is that it's one that I imagine happens over and over everywhere.